Your pediatrician recommended it, your friends swear by it, and your child’s preschool uses it incessantly. But, every time YOU try to send your child to time-out, the 5-minute time-out turns into a 30-minute throwdown of epic proportions. For most parents, using time-out to “teach kids a lesson” often increases the power struggle and ends in frustration, anger, and fails to achieve the desired outcome. Or, in other cases, getting the child to go to time-out isn’t necessarily a battle, but the child continues to misbehave once their time in the corner is finished. While well-meaning parents have used time-out as an alternative to more punitive methods like spanking, it doesn’t seem to reap the long-term benefits we hope for. After all, we are running a marathon, aren’t we? When we take a short-sighted approach to discipline, we leave the door open for long-term problems. Sure, a time-out might curb behavior in the moment, but it doesn’t promote our long-term goal of raising emotionally stable, resilient, and empathetic children. If you are a proponent of time-out, this is not a finger-waving post of judgment, I promise. I, too, was once a time-out queen myself. But, as I found the tool to be increasingly ineffective in my home, I knew I needed other tactics. Why Are Time-Outs An Ineffective Long-Term Solution? There are many reasons time-outs don’t work for the long haul. For one, times have changed. The concept of time-out as a discipline technique dates back to 1958. And while we can appreciate a lot of what the 50s brought us, our world is very different, and the way we communicate, behave, connect, and respond as human beings is very different as well. But secondly, and perhaps more convincingly, let’s consider how time-out is used by examining a few questions. Does the time-out have any direct relation to the behavior? Children see the world in black and white – they want things to feel fair and consistent. When disciplining your child, it’s important to ensure the consequence is related to their misbehavior (i.e. they don’t get sweets if they refuse to brush their teeth, or they can’t play with their soccer ball if they kicked it inside the house, etc.). 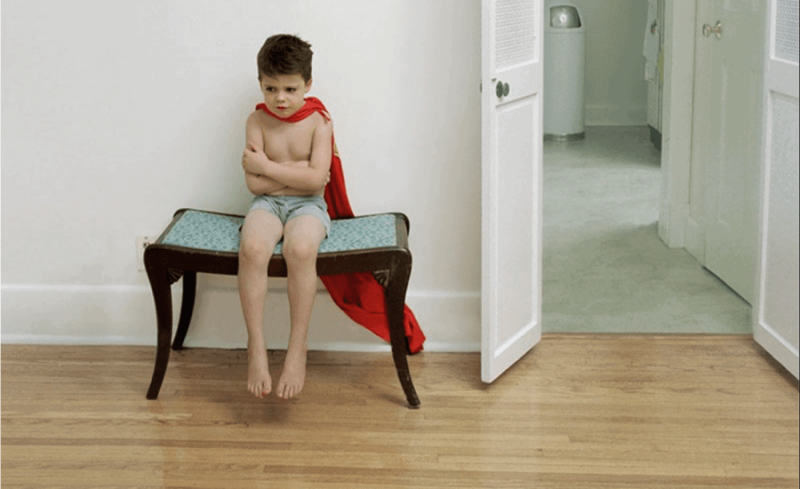 When it comes to time-out, however, the consequence is almost never related to the behavior. How does sitting in a corner or time-out chair relate to hitting your brother? Or throwing your food at the dinner table? Or using foul language? In short, it doesn’t. If your child frequently resists going to time-out or throws a huge tantrum over sitting in the corner, you can be sure this is their way of protesting the fairness of the consequence! What does the child learn during the time they are isolated? More often than not, time-out is a break – a time when the child is expected to sit quietly while the parent continues their task until the timer goes off. But what does the child learn in those 5 minutes of silence? Are they learning other ways to respond? Are they developing new strategies for behavior? Are they thinking about the poor choices they made and what they could do differently? Or, are they thinking how unfair and mean Mom or Dad is for putting them in a corner to start with? More likely the latter, don’t you think? Does time-out support an emotional connection between the child and parent? The latest research tells us that children learn best when they have a secure emotional connection with the parent. For decades, parents have opted for time-outs over its punitive cousin, spanking – believing that because time out doesn’t inflict physical harm, it doesn’t cause any harm. While time-out in and of itself is not likely to give your child abandonment issues, this new research should inform our parenting decisions. If given the choice – and we are given the choice – shouldn’t we strive to use tools that foster more emotional connection when we can? Does time-out teach the child the appropriate behavior you want them to use in the future? When a child hits their sibling for taking a toy, does sitting in a chair help them practice a more appropriate behavior? With only limited hours in a day to guide and instruct our children, how can we be most effective in those moments? We (and our children) are better served by first showing empathy. Obviously, the child is having a tough time in that moment. By showing empathy – “Wow, you seemed really mad/frustrated, etc.” – we make an emotional connection with our child. This makes him more open to calming down and learning for the future. By sending our kids to time-out, we miss the opportunity to model empathy for them. We lose the privilege of teaching them empathy through our own actions and response. The bottom line is that time-out – like its “counting-to-three” counterpart – can disrupt the behavior in the moment, but unfortunately doesn’t work long-term to teach more appropriate responses. Furthermore, it’s not conducive to helping you build a long-term, mutually respectful relationship where your kids will listen and learn without threats, nagging, or time spent in corners. If you’ve been using time-out, take comfort in knowing you can enjoy better results by using more effective strategies that will bring out the best in your kids without the negative side effects. Before I give you some strategies that work, let me say, if you’ve been using time-out for years, this post is not meant to discourage you on your parenting journey. Nor is it intended to make you feel inadequate as a parent. Trust me, we’ve been there. Here at Positive Parenting Solutions, we are living proof that knowledge is power. When I finally learned strategies that worked, an unbearable weight was lifted and my frustration was gone. Our goal is to equip you with knowledge so you can be the best parent for your kids. It’s critical you understand that children are independent beings and – even as young as three – they know it. Imposing our will, even on our children is a sure recipe for a power struggle. We are staunch supporters of proactive parenting. When parents understand that they can proactively prepare their child for difficult situations, they reduce the likelihood that they will need to reactively respond. While it’s nearly impossible to cover all alternatives to time-out, here are 3 simple tools you can implement now to reduce the need for reactive consequences. Kids need attention, plain and simple. If we don’t keep that “attention bucket” filled with positive attention, kids will seek out any attention they can get – even negative. They’ll push our buttons with negative behaviors because, to a kid, even negative attention is better than no attention. This doesn’t mean you have to be at your child’s side 24/7 – just take a few intentional minutes a day to spend one-on-one with your child, distraction-free and do something they want to do. It will reap immense rewards in their behavior. Let the phone call go to voicemail. Ignore the incoming text alert. Focus that time on your child. You won’t regret it. When you fill your child’s attention bucket positively and proactively, your kids will become more cooperative and less likely to seek out attention in negative ways. Life is busy for everyone, and finding extra time in the day may be daunting at first, but think of this as an investment in your relationship with your children and in improving their behavior. When it comes to knowing how to discipline your child, giving them what they need to avoid poor behaviors can have a great impact. The root word of discipline is disciplus which simply means “pupil” or “student.” If we are disciplining our children, we are essentially trying to teach and instruct them – not punish them. The best way to discipline your child is to help her make better choices. Role playing is a great strategy to help children learn other ways of responding. For example, you could talk through the following scenarios using a calm voice and take turns playing each role. Switch roles and pretend you’re the child, and let your little one direct you through making better choices. Kids thrive when they have structure and know their boundaries. Don’t go overboard with hundreds of rules, but focus on what’s most important for your family. Be clear about the ground rules and what happens when someone breaks the rules – make sure that everyone understands the consequences ahead of time and that the consequence is related to the misbehavior. If they forget to put away their dishes after dinner, they have to load and unload the dishwasher. But cleaning their room because they didn’t do their homework isn’t related, and therefore, not an appropriate consequence. Most importantly, be consistent. Follow through every time with the agreed-upon consequence when kids push the rules. Overall, my friend, just remember that disciplining is simply teaching your child how to learn new skills and make more appropriate choices. So stay calm, be firm, give them the attention they need, and set clear boundaries and stick to them. As always, we are here when you need us and would love to have you experience the life-changing effects of Positive Parenting Solutions! Nationally recognized parenting expert Amy McCready is the Founder of Positive Parenting Solutions and the best selling author of The “Me, Me, Me” Epidemic - A Step-by-Step Guide to Raising Capable, Grateful Kids in an Over-Entitled World and If I Have to Tell You One More Time…The Revolutionary Program That Gets Your Kids to Listen Without Nagging, Reminding or Yelling. As a “recovering yeller” and a Certified Positive Discipline Instructor, Amy is a champion of positive parenting techniques for happier families and well-behaved kids. Amy is a TODAY Show contributor and has been featured on CBS This Morning, CNN, Fox & Friends, MSNBC, Rachael Ray, Steve Harvey & others. In her most important role, she is the proud mom of two amazing young men. What is Positive Parenting? Does it Work? Copyright 2019 Positive Parenting Solutions. All rights reserved.